So you are in the market for Bluetooth compatible noise-canceling headphones. There are quite a few options to choose from, but you do not have a lot of money to spend on them. Perfect. We just might have found the perfect pair for you. We understand you might question the quality of these headphones based on their price and usually we would commend you for that. We have all heard the saying "You get what you pay for." And usually, it is true. If a company advertises a product that boasts of high quality for a price that you would expect to belong to a lower end item, it usually means that the manufacturer has compromised on something. 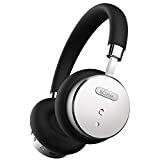 However, we have found a pair of Bluetooth compatible noise-canceling headphones that can compare with some of the best on the market. And it is only a fraction of the price. Read on to see what we think of the Bohm B-66 headphones and how they compare to other similar and quality headphones. Bohm is not a very well known company and has not been making headphones and sound equipment for very long. However, they have really impressed us with this incredible pair of noise-canceling headphones. These are lightweight, comfortable, very stylish and even offer two different color options. As for the sound, it is impeccable. Your music will sound better than ever with clear mids and highs and powerful lows. It is equipped with quality Bluetooth pairing, noise-canceling technology, and a long battery life. They are foldable, come with a case and charging cord. After reading through this review and seeing all that these headphones have to offer you will be just as amazed as we are to know that such a deal is out there to be had. The Bohm B-66 headphones are quite the find. Let's start with what we see. These lightweight aluminum headphones are detailed with zinc alloy metal to add to some style and are available in either black with silver details or gold with tan details. The headband and ear cuffs are wrapped in soft leather and padding for long-lasting comfort. The headband is adjustable to most sizes and is also foldable for easy storage in the included case. You will also see that the left earcup houses your easy-to-use power button and playback controls. These include volume up and down, next or previous song, and answering calls button. An inline microphone allows you to easily answer phone calls with the push of a button all while not being interrupted by ambient noises. Whether you are playing music listening to an ebook or watching a movie, the entertainment will stop when a call comes in and when the call is ended, it will automatically pick where it left off. The Bohm B-66 is given power by a rechargeable lithium-ion battery. It takes three hours to charge fully and is then able to give you 16 hours of stereo entertainment and 18 hours of communication. It does come with a detachable charging cord and a USB cord for added versatility. As these are headphones, we could not continue this review without talking about the sound quality they have. These are surprisingly good for the price. The Bohm B-66 has two 40mm drivers that allow for a powerful audio output that until now we have only seen on much higher priced models. It is common for lower end models to not have very good sound and for some parts of the music to be lifeless and dull or too sharp and scratchy. These are not like that. Review after review has proved them to be very well balanced, offering a good sound no matter what. They have a range of 20Hz-20KHz, which gives you every detail effortlessly and with clearness. However, it is noted that the bass can be somewhat lacking at times. This is common even in most of the high-end models that we compared the Bohm B-66 to as well. All wireless headsets seem to have some issues with low bass sounds. The active noise cancellation in this pair headphones is unlike most found in a similar price range. This function can be turned off or on to let you hear what you want to hear when you want to hear it. While noise cancellation is not quite up to par with some of it high-end competitors, it does the job very nicely, especially for such a low-cost pair of headphones. These headphones are also Bluetooth compatible making traveling to and from anywhere a joy. You can take your favorite music, sports, movies, games, and books with you any time you want. This model is paired with Bluetooth with a CSR chip, which is a ROM solution for Bluetooth devices that enhances the stereo during Bluetooth streaming. This, added to the long range of the Bluetooth makes the Bohm B-66 easily comparable to far pricier models. The range of the Bluetooth on these headphones is as far as 33 feet. This is huge in comparison to many similar models on the market. It is noted that the Bluetooth it uses is not the latest 4.1 technology. However, it is not far behind with its 4.0 implementation. The price of this product just might be the most amazing thing about these headphones. They can be found, in all their quality, for around $100. This product can be found both online through sites like Amazon and eBay as well as in stores like Wal-Mart that have electronic departments. The acoustics contain fairly well-balanced sound with warm and detailed highs, prominent mids and powerful lows. They are lightweight and comfortable to wear all day. They have a long battery life of 16 - 18 hours depending on what you are doing with them. There is some small noise leakage that some will notice. They are not made of the most durable materials, but most headphones are not. This model of noise canceling headphones may be one of the best out there today. It seems to have it all. With a well balanced and full-bodied sound produced by two 40mm drivers, these can produce all of your favorite music effortlessly. They are compatible with the latest Bluetooth technology allowing you to go anywhere you want with your music, all day long. These have an amazing battery life. They can keep you entertained for up to 22 hours with both Bluetooth and Noise Gard activated without interruption. They are also very comfortable and stylish as well. They are designed with a stainless steel metal arc, and premium leather wrapped headband. The ear cuffs are made with memory foam and a soft leather that gives deep comfort and a perfect fit. The headband is adjustable as are the earcups for an even better fit and comfort. They come with a compact case that they fold into for easy storage and even more on the go versatility. 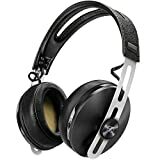 Sennheiser also offers a two-year warranty on them if they are purchased through an authorized dealer. They are comfortable enough for all-day wear. The noise cancelation is of good quality. It has one of the longest battery lives on the market. These headphones are just what their name implies. Quiet when you want and comfortable all the time. This model of headphones are Bluetooth compatible has noise reduction capabilities that are leading the industry. Whether you are at a busy airport or at your favorite coffee shop, these headphones are perfect to block out any noise you want and keep in your favorite sounds. The sounds offered are crisp clear and ready to go when you are. They even have the ability to run without using the battery, which does have a reasonably long life. They are also one of the lightest on the market, proving that they are made for all-day wear if need be. They are easy to use with the Bose Control app right on your smartphone or Bluetooth enabled device. They are foldable as well and come with a handy protective carry case. They come in several different colors and are extremely customizable. Bose offers a limited warranty if they are purchased directly from them or from an authorized dealer. And, as they do with all of their products, they offer a 30-day money-back guarantee. If you are not satisfied with your purchase within the first 30 days, you can return it for a full refund. These were really quite surprising. They offer a sound that is almost unmatched. The 50mm drivers deliver amazing balance and full, rich sound. It gives the feeling that you are attending a big musical performance instead of just wearing headphones. The noise cancelation is really efficient as well. It reduces up to 99% of ambient noises. Unlike the Bose headphones that have adjustable noise reduction Sony built in software that adjusts the noise for you. So if you walk into a loud and busy room, it will notice and adjust the amount of noise to be filtered out without you having to lift a finger. This is incredibly smart. It also includes a rechargeable battery for all-day fun and is lightweight and comfortable. The deep padded ear cups allow for maximum comfort for as long as you need. Sony does not offer any warranties on this product. The sound put out by these outperformed every other pair. They are comfortable to wear for long extended periods of time. They have been replaced by a newer model, which we may note are not as good for the price, and so are harder to find. We have only found them online. After careful consideration and comparisons, we give the Bohm B-66 Bluetooth noise canceling headphones a 4 out of 5 overall. Just looking at the numbers, we can see this is the best buy. All other models that compare to it, in so much that they offer everything these do and sometimes less, are much higher prices. As you can see by the other models we have listed here; they are out priced by at least $100. Yet they are found to be of great quality. They may not be quite as good as Bose's when it comes to the noise cancellation or as well balanced in sound as Sony, but to say that they compare at all in this price range is something to take into account for sure. They are ranked as one of the most comfortable due to its padded and leather wrapped earcups as well as it's lightweight aluminum frame. They are also given great Bluetooth abilities that reach far beyond what most competitors do. The battery life is longer than most and in a wireless headset that is extremely important. An added benefit is that they are stylish and look good on anyone as well as come in more than one color. To offer so much and not be horrible at any one thing is hard to do for any piece of equipment. These have done it and have somehow also gotten away with only charging a fraction of what its competitors are. We find this incredible and would encourage you to look into these pair of noise cancellation Bluetooth headphones for yourself. You might find they are the perfect fit for your needs without spending too much of your hard-earned money. Offering well-balanced acoustics as well as detailed sound quality. The Bohm B-66 wireless Bluetooth headphones also offers long battery life. However, despite of having noise cancelling capabilities, small noise can still penetrate to its system.